Jean Bonnin eventually settled in Wales and by chance met Yvelaine. This is what he has to say concerning his decision to translate these aphorisms;. “Malcolm de Chazal was born in Mauritius to French parents and Yvelaine Armstrong was brought up for the first few years of her life on the island of Mauritius. Yvelaine’s mother Marie-France, who was an artist and poet in her own right, moved to the island during the sixties, a time when the independence movement from the British Empire was in full swing, and when politically everything was in flux. She loved de Chazal’s work and soon became a very good friend of his. To the extent that it was she who procured many paints and paper for his pictures, persuading him to use better quality products than he had been. Eventually, due to the closeness of their relationship, de chazal fell in love with Yvelaine’s mother and proposed marriage. Marie-France told him however, that she didn’t see him in that manner and just wished to remain good friends. Then came the time when Marie-France was planning to return to London. Naturally, on hearing this news, he was upset, but at the same time he was excited. Excited by the possibilities this might present. He immediately brought her many of his paintings—all that wee in his possession at the time. He did this in part as tokens of his gratitude and as a representation of the fondness he felt for her, but also as examples of his work for her to show galleries (which Marie-France did for many years afterwards). de Chazal instructed Marie-France to burn any that she considered to be of inferior standard. Yvelaine indeed remembers seeing as a child the pile of paintings he’d brought around. This amounted to hundreds of paintings, of course none of which she burnt. And now they constitute what is known as the Armstrong Collection—which, as far as anyone knows, was the largest single collection of Malcolm de Chazal’s work. This then, is Sense Magique, Magical Sense, Magical Wisdom, Magical Meanings… Magical Sense. One hundred and twenty five copies were published at the expense of Régis de Chazal who generously gave them to the Family and made them available to those who had an interest. Compiled by René de Chazal, it consisted of a compilation of all the correspondence, before, during and after the French Revolution; principally between François, Pierre and Toussaint. Few examples of this work have survived the past one hundred years; furthermore we have no idea if the letters forming the basis of the work still exist. It would be fitting if we could enter some notes and photographs of René, concerning his life in India and elsewhere on the de Chazal Website, also of his brother Louis. Christophe Chabert has reproduced all the original text much enhanced by the initial pages giving the context of the letter writers—their genealogy and connection to the family. For Chabert it was important that these notes be made available because “it gives an understanding of an époque, a social class, a human adventure—that of colonisation—intimately connecting French and Mauritian history. Following the destinies of individuals, light is shed on the Ancien Regime, the French Revolution, the rise of colonialism and the importance of the sugar industry”. The transcription of “Notes et Documents” is enhanced by footnotes on almost every page helping the reader along and occasionally adding to the text. Christophe has produced a book complementing the original content with his own comments and notes obtained by painstaking research. The production of these notes and documents in book form, available to the family and to the public at large, extoling the virtues, exploits, character, vision and even genius of the de Chazal family is to be applauded. Chabert’s enthusiasm and interest in this family and period of history overcomes some of the negative aspects. Some of it is dry reading, extracts of certificates for example. For any member of the family it is an essential addition to their bookcase. Christophe Chabert has also written a novel entitled “Dans L’enfer de Montlédier” reviewed on this website. Éditions de l’Harmattan have recently (November 2006) published a novel by Christophe Chabbert entitled “Dans l’enfer de Montlédier”, a work in which Malcolm de Chazal and his ancestor Francois de Chazal de la Genesté from Mauritius have a leading role. This 35 year old author, literature professor from the South of France wrote his thesis on the life and works of Malcolm de Chazal. Translator’s note: Christopher Chabert is now (February2014) an established author. In 2009 “la Belle Clotilde” was published and now we are now looking forward to his new novel written in letter form which will focus to a considerable extent on the de Chazal family. 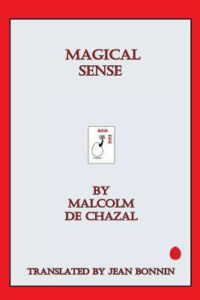 Christophe chose to write his thesis on the life and works of Malcolm de Chazal and his enduring fascination with the subject and the man has now extended to other important members of that family. We should be grateful for Christophe’s contribution in enabling the de Chazal name to be better known. 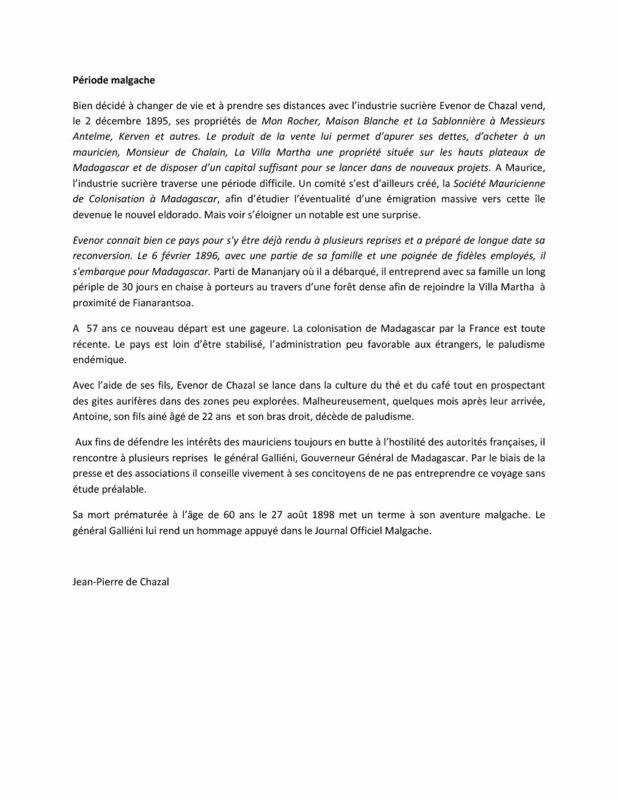 His book has not yet appeared but I am confident that the great respect Christophe has for the de Chazal family will enhance their reputation. His story telling is second to none and for that reason alone we should buy and read his book with a degree of pride and excitement.